The red imported fire ant (RIFA). 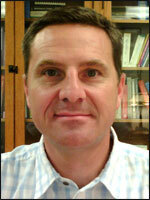 Photo courtesy University of California, Riverside. Cattle producers who buy hay from some parts of the southern U.S. might get stung — not just once but many times — by red imported fire ants. An Ozark County farmer recently learned that lesson the hard way while unloading hay he’d bought from a farmer in Florida. Unlike most ants, which usually flee when disturbed, these bugs went on the attack. The drought has left many Missouri cattle producers short on feed and forage, prompting some to buy hay from out of state, including from sellers in Florida and other southern states that are home to burgeoning populations of red imported fire ants. An aggressive, stinging insect native to South America, the red imported fire ant (RIFA) is a significant pest throughout much of the southern U.S., infesting several hundred million acres in more than a dozen states, according to the USDA’s Animal and Plant Health Inspection Service (APHIS). Under USDA regulations, hay in areas with established RIFA populations must be inspected and certified before being shipped out of a quarantine zone. But many hay buyers are unaware of the risk and not realize that a seller may have skirted federal regulations, said Stacy Hambelton, MU Extension agriculture business specialist in Ozark County. “Farmers should consider purchasing hay from northern parts of the country where fire ants don’t exist,” Houseman said. If that’s not possible, then make sure the hay has the required certificate from APHIS indicating that it has been inspected. As a further precaution, inspect the hay yourself upon arrival. This isn’t the first time these ants have showed up in the Show-Me State. In 2009, red imported fire ants went undiscovered long enough to build their distinctive mounds on a residential property in the town of Kennett in the Missouri Bootheel. As far as anyone knows, however, there are no established populations of red imported fire ants in Missouri. But the recent high traffic in out-of-state hay dramatically increases the odds that some ants will escape notice long enough to establish themselves in parts of southern Missouri, where winters may be mild enough for colonies to survive year-round. An established colony will eventually produce winged ants called alates, some of which may start new colonies up a quarter-mile away. Once red imported fire ants start producing daughter colonies, they can be very difficult to eradicate. While painful, attacks by red imported fire ants are rarely fatal to people or livestock, but the ants still pose a serious economic and ecological threat. They can damage soybeans and other crops, and their mounds may disrupt farm operations and damage equipment. 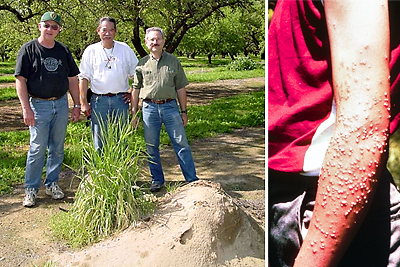 Photo of a red fire ant mound and the physical damage that the insects can create. Photo courtesy University of California, Riverside. Red imported fire ants disrupt natural ecosystems by displacing beneficial native insects and killing small mammals, reptiles and ground-nesting birds, he said. Worker ants out foraging for food will typically respond to threats by attacking en masse, latching on to victims with their mandibles, then maneuvering their abdomens into place to deliver repeated jabs with their venom-filled stingers. Their unusual alkaloid venom produces an acute burning sensation — hence the name “fire ant” — followed by the formation of itchy or painful white pustules that may take days to disappear. Underground colonies can undermine sidewalks, roads and bridges, inflicting extensive and costly damage, Houseman said. The ants also have a mysterious attraction to electrical equipment, Houseman said. They will nest in circuit breakers, air conditioners and similar items. They have shorted out traffic signals and disrupted power in buildings. According to a study at Texas Tech University, fire ant damage to electrical and communications equipment in that state totals hundreds of millions of dollars annually. 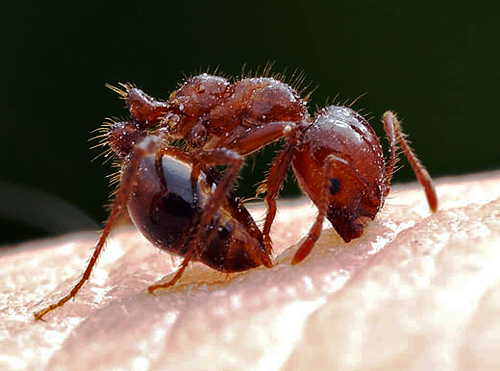 Houseman urges those who suspect the presence of red imported fire ants to contact their local MU Extension center and the Missouri Department of Agriculture.